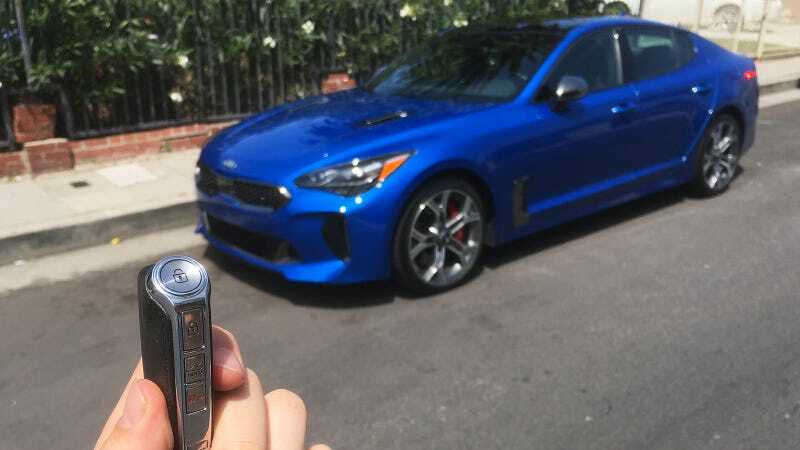 Critics have been singing the 2018 Kia Stinger GT’s praises since the car was released last year, but today was the first time I’ve held the keys to one of these and hot damn–the fob is a thing of beauty. So is the T-shaped shift knob. If this car is as fun to drive as it is to touch, I think it’ll live up to the hype. I haven’t started the Stinger yet because it’s in a really convenient street spot and I’m not about to waste that kind of real estate. Kidding, it’s because I have other work to do, but I am freshly hyped about the thing after examining the detonator-style remote key fob. People have been excited about this aspect of the Stinger for months, and now I realize, it’s with good reason. In fact, I’ve only been looking around the car for less than a minute and I’ve already found a third touch point I like: the interior door pull is cool too. The shape is awesome–look at how the top seems to float, but is still connected with a neat little piece. Oh, and the texture. Yeah, it’s that sweet semi-soft rubber that gives you great grip without seeming cheap. So I’m happy to report that the Kia Stinger provides and exceptional pre-drive experience which, until now, was something I haven’t spent enough time thinking about. The key is cool to look at and hold. I agree with my friend and fellow car writer Steve Ewing that “the unlock button should be on top,” but whatever. Once the car is unlocked, pulling the door closed behind you is fun because you get to hold that sweet looking handle. Very Star Wars meets ’70s muscle car, so I’m into it. And finally, man, just seeing that retrofuturistic T-shaped shifter has got me hyped. 2018 Kia Stinger GT: great car at 0 mph. I’m looking forward to reporting how it feels at 1 and maybe even more mph soon.